Painting a living room or bedroom is a familiar project for most do-it-yourself homeowners. In these areas, the obstacles are low and the rewards are high. With a minimum of effort, you can get a fantastic payoff. But painting the bathroom is a bit different. Bathrooms are small, full of water from various sources, and receive lots of heavy use. This is why it is important to pay special attention to all aspects of bathroom painting, from surface preparation and color choices to the process of painting and the follow-up. Soap scum and other embedded substances on surfaces can seriously interfere with your paint job. In other areas of the house, you can sometimes slide by without cleaning the walls. In particular, dining rooms and bedrooms usually just need a light dusting. But in the bathroom, it is crucial to clean the walls. Soap scum around bathtub and shower surrounds can cause your nice paint job to peel off. And that's if you can even get the paint to stick in the first place. Trisodium phosphate, or TSP, might be considered a miracle cleaning product because it is so inexpensive, cleans off the gunk, and won't compromise your paint job. It is exceedingly difficult to paint around toilet tanks and do a good job of it. Specifically, the problem is that ultra-narrow crack between the tank and the wall. But the space is so small, you have to meticulously apply painter's masking film and painter's tape around the tank, then daub the brush repeatedly in that area to get a solid color. Instead of working around the obstruction, how about removing the obstruction? Removing the toilet tank may sound messy and difficult, but it is not. Toilets typically come in two sections: the top tank and the lower seat. The messy section is the seat, and that section is not coming off. Turn off the water supply at the toilet base, flush the toilet to expel all water, then remove the tank with a couple of old towels on the floor to collect run-off. Dark, weighty colors in small spaces often make the user feel claustrophobic. Should you surrender to that classic bathroom color, white? Not necessarily. 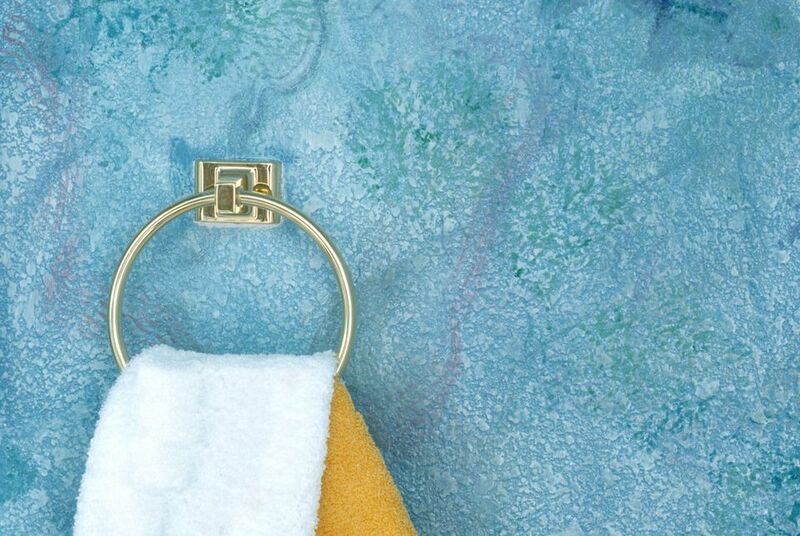 Light, airy, bright bathroom paint colors such as light-blue or light-yellow always work well. Since darker paint colors make spaces feel small, any type of lighter color will be an improvement. However, this is not an iron-clad edict. To make darker colors work in bathrooms, include other elements that leaven the ponderous feeling that dark colors bring on. Shiny, reflective chrome or brass sink fixtures or cabinet pulls add bright stars of light to dark spaces. Also, make sure that your bathroom lighting is adequate both for the space and for the color palette. Bathrooms have lots of water, and some of it will get on your paint, no matter how hard you try to avoid this. Some paint manufacturers sell what they call bathroom paint: paint that has both mold-inhibiting agents and a better surface for resisting moisture. Even if you don't want to buy special bathroom paint, you may want to spend a little bit more for a quality brand of paint. Some of the cheaper paints have the same pigment makeup as the more expensive paints, but they have fewer solids. Solids are the physical product that dries to form the protective acrylic-latex layer on your wall. Often, it pays to buy a better (and often more expensive) paint, so that more solids are deposited on your bathroom wall for greater durability. The next time you look at shower tile, notice that the surface of the tile is glossy. Higher gloss sheens tend to do a better job of repelling moisture and debris than do flatter sheens. If you have drywall in the upper section in the shower or tub stall area, go for the highest gloss paint, such as Valspar Ultra Premium Bath and Kitchen Enamel. Less water-intensive areas need at least satin or eggshell paint sheens. Choose semi-gloss or glossy sheens for the bathroom ceiling. Flat or matte sheens can develop water streaks and are not recommended for bathrooms.